So I thought I would share with you 5 simple ways to grow your team. When we talk about building the culture we want to first talk about having a vision for your worship team.So ask yourself this question. Why should people want to be on the worship team? By sharing the vision, your team will know if this is something that they can get behind or not. Do not be afraid to lose teammates over casting a vision. King Solomon said it best, “People without a vision will perish.” So, what kind of culture do you want to build? 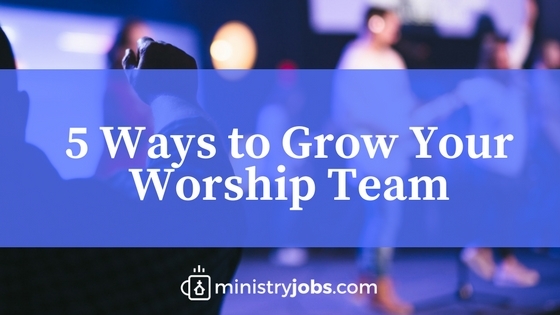 Worship team expectations or team commitments are essential for building your worship team. It is a way for people to not only see the vision of the team, but to also have a good idea of what they are getting into and what is expected of them. You may also want to include a vision statement as well as a list of your team believes. i.e. We believe every week something powerful happens when we worship Jesus. There is a true and real statement in the worship world when talking about worship teams, “Excellence Attracts Excellence”! Though this is true, the simple truth is people want to be asked. Try not to assume they don’t want to play with the team. Maybe they are just waiting for someone to ask them? You never know until you ask. As a volunteer at our church, you are not just on a team but you are part of a worship family. We love to get together and one way we do this is by having All Team Nights. This consists of all our worship and tech team coming together once a quarter. We have a time of worship and encouragement. We talk about upcoming events as well as changes that we are going to be making. This is truly a great time for the whole team to be unified. If you can, build a lead team. This is so key as it helps cast the vision and unite. Your lead team will also be able to see things that you as a worship leader may not see. They will help you dream and implement new ideas that you may not be able to implement yourself. Try to find a time, each month, to sit down over coffee or a meal and talk about how things are going. Always try and answer the question, “Are we better than we were 3 months ago?” Trust me when I say this is a game changer! Written by Derek Harsch. Derek is the Marketing Director of Froot Group, a worship staffing and consulting company.